Ok friends, hope your day is great and I'll catch ya later! 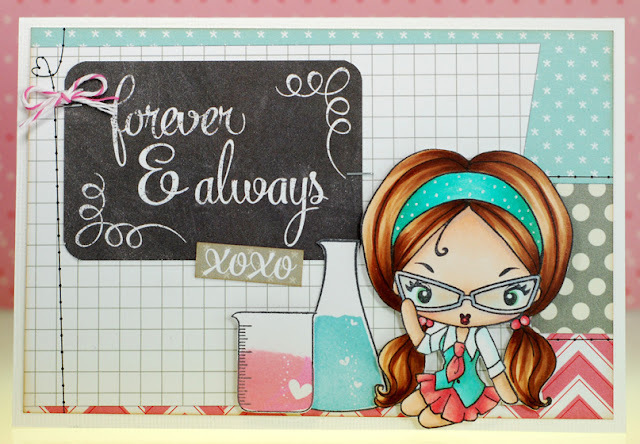 There is plenty more Hershel, Bonnie and Esther sweetness from my fellow ATS teamies so be sure to check out the All That Scraps blog today! 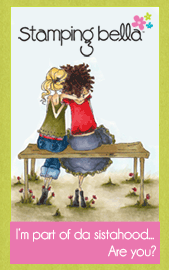 And all of the new February stamps can be found right here in the ATS store. Alrighty, I've got a couple things to do before heading to town so it's time for me to sign off. TTYL! Well, I've got to scoot my boot. I'll talk at'cha in 24! Okey dokey, time to figure out what to do with myself today. I'm sure at least some of my time will be spent getting crafty... hope the same goes for you too! 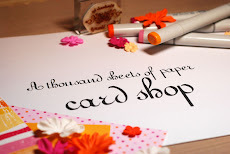 But because it was a long day of shopping, I didn't leave myself any time to create a new card to share today. That is why I'm posting a non-coloring card that I did a while ago. 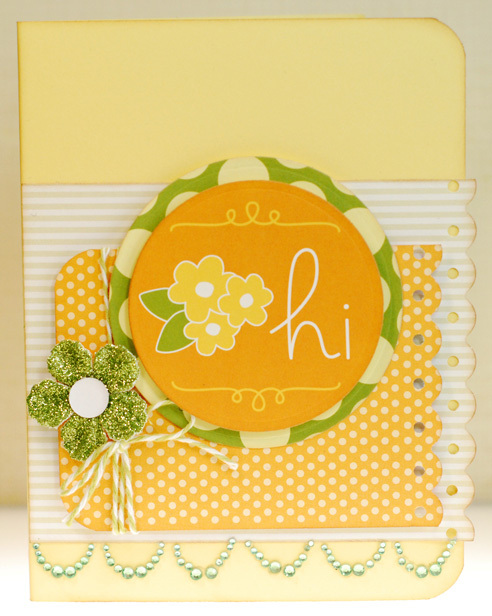 It's a fave color combo of mine with all of the citrus orange, yellow and green with just a touch of grey thrown into the mix. Quick and simple, letting the paper do all of the work... including the sentiment. It doesn't get much easier than that! Oh, and before I head off to work... yesterday there was some questions about whether I had any videos made on how I masked stamped images so I'm linking up to two that I did which you can see here and here if interested. I'm taking the day and heading to 'the big city' for a shopping trip with my mom. It should be fun to get out of town even if most of it is for grocery shopping. I do plan on making a side trip to JoAnn's to check it out, though most likely it will be the usual sad selection. It's too bad that the new Hobby Lobby won't be open for another couple of weeks... I guess that just means I'll have to plan another trip after the grand opening. And because Thursday is a classic Creeper I've decided to enter this card into the current Retro Fresh Challenge over at The Greeting Farm. 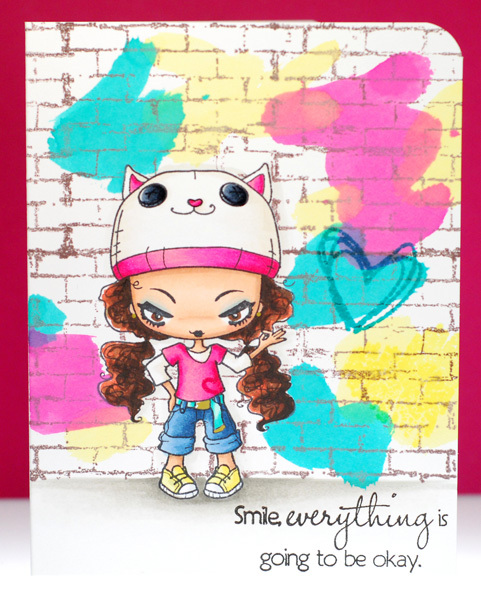 It's to use hearts on a card so I added one to her shirt and another to the 'paint' on the wall. Ok, time for me to get ready to hit the road. Have fun today, I sure plan to! Alrighty, I'm audi... have a great one! 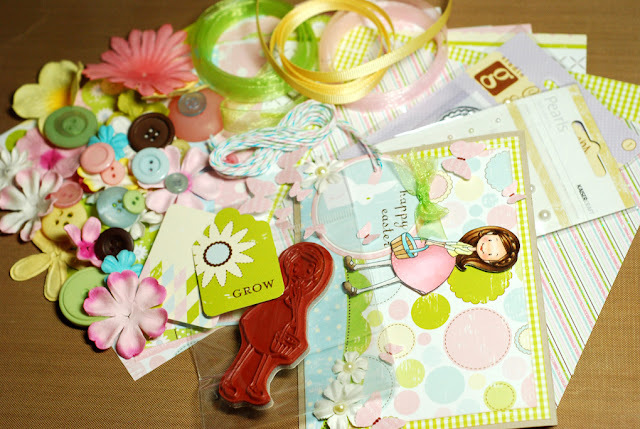 It's review preview time at the All That Scraps blog once again. 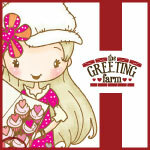 The card I made features the new Fan image from Mashi's Muffins and she is such a giggly, sweet, little cutie. I wanted to find something really perfect to set the scene for this one and at first I was at a bit of a loss. So I started digging around but wasn't finding anything inspiring. I was about to give up and just make do when I spotted a small stack of old paper pack cover sheets under my desk. I pulled them out and near the bottom of the pile was this Konnichiwa sheet covered with all these perfect vignettes for Miss Fan. It had everything I was looking for and there was the added bonus of getting another sheet of paper gone... yea! I may have been overly ambitious with my wish for exciting Saturday night plans yesterday. I wanted to believe that I was completely over this flu but I think it was still sapping my energy at the very least. Once I got home I almost took a nap right on the couch and I never do that! Needless to say there was no wild night to be had but I did catch up on the last season of Worst Cooks in America. That show sure makes me feel a lot less hopeless in the kitchen, LOL! 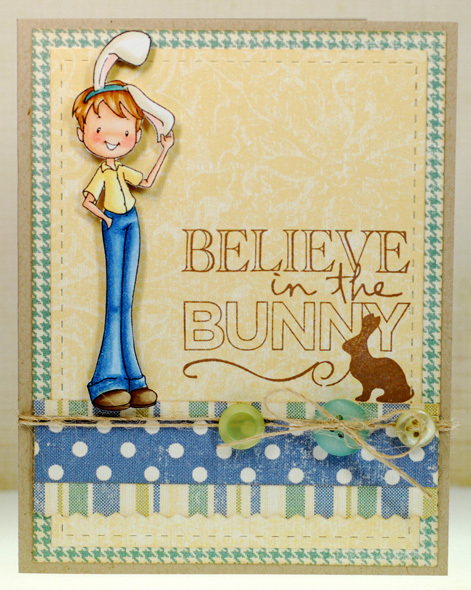 Alrighty, my card today is for the Farm Fresh Friday challenge over at The Greeting Farm. 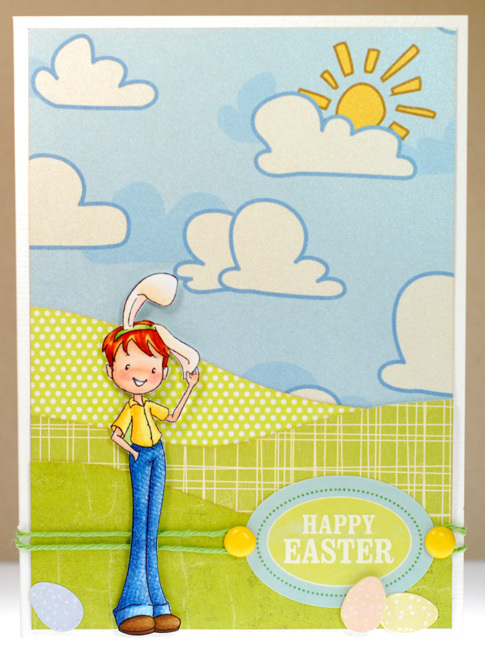 For this challenge they want us to use die cuts on our cards and projects. 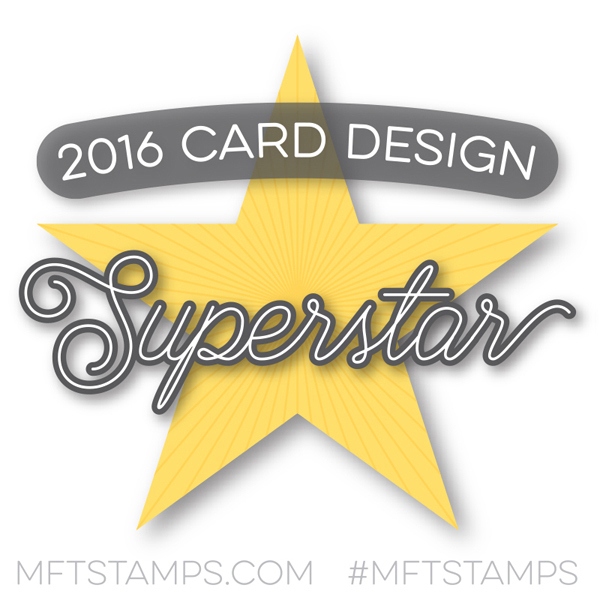 I really wanted to use this new little star die set so it seemed a good opportunity to make another boy card. I decided to ink up Wild Sprout Eric because I thought it looked like he was playing dress up with that super hero cape and that fit with the energy of the paper I had selected. Well, that's all she wrote... talk to ya manana! I don't have much going on today other than work. No exciting plans and know idea what I even want to do. You ever wake up to those kinds of days ahead of you? If we had a decent theater close I'd be tempted to go see a movie or something but I don't feel like making the 45 minute trip to town just for that. Hmmm... I hope something interesting presents itself before the day is through. Ok folks... 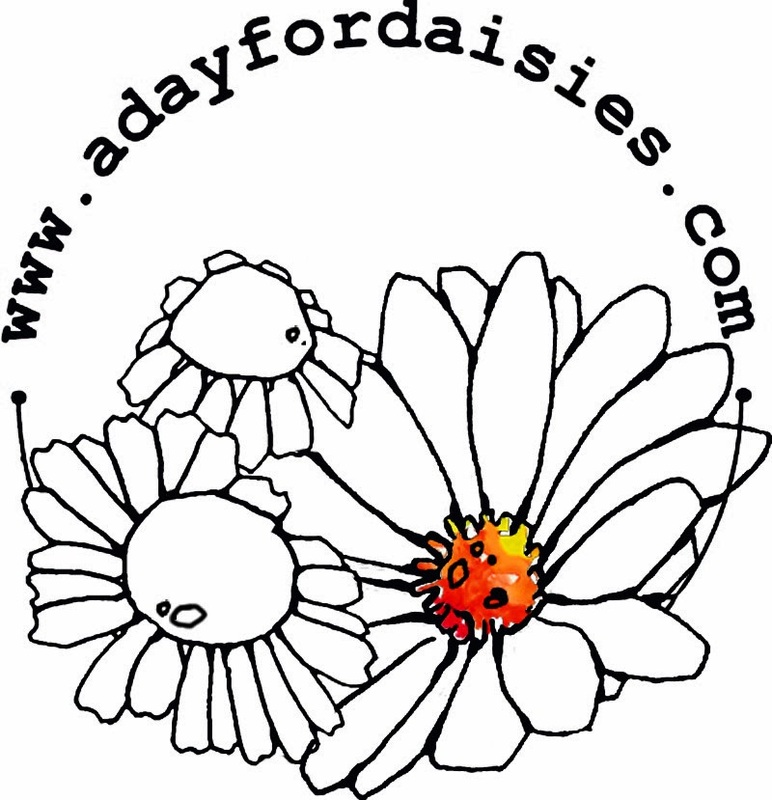 I hope your weekend is full of fun and sunshine. I can't believe that we are already approaching another weekend. I suspect the days spent in bed are to blame for speeding things along but considering how lovely the weather is at the moment, I'll take it. We've been getting lots of sunshine recently and I've been watching the snow melt a bit more each day. Sure the nights are still below freezing but I'm hoping to take advantage of the nicer weather and get out for a while on Sunday. Alrighty, time for me to scoot my boot. Have a great one and I'll see ya in 24! I've just got a quick minute to wish you all a very lovely Valentine's Day! 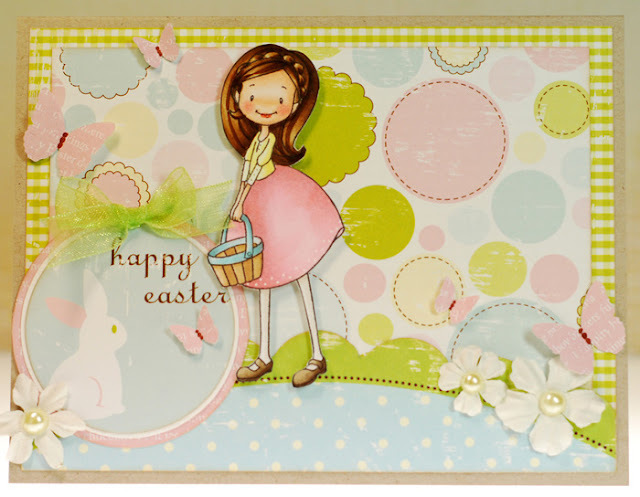 BIG love and hugs my friends... hope you get to enjoy some chocolate or other sweet things today! By the power of Vicks VapoRub my voice has returned just in time for work. I'll still be packing plenty of cough drops just in case but all in all I feel ready to face the world again, LOL! My card today is for the Farm Fresh Friday challenge over at The Greeting Farm. 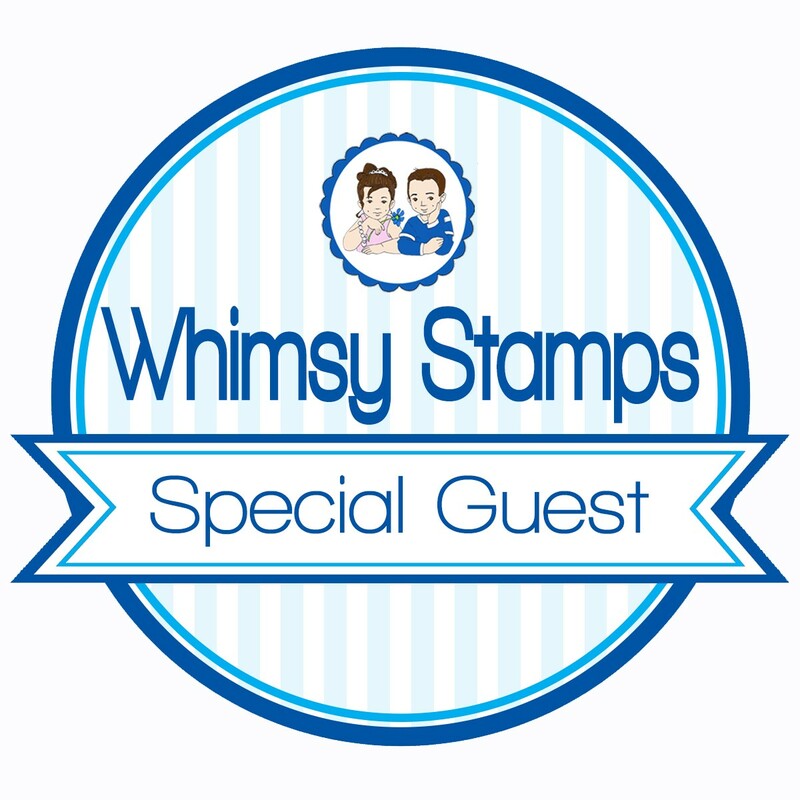 This week they want to see baker's twine and buttons on our cards. Anya Lifts is another one of those stamps that I've had stamped up and waiting... waiting... waiting. I don't know why it took me this long to get around to her but I'd like to think it was because Anya was holding out for some different papers to go with her. Enter the Midway paper pad from October Afternoon... 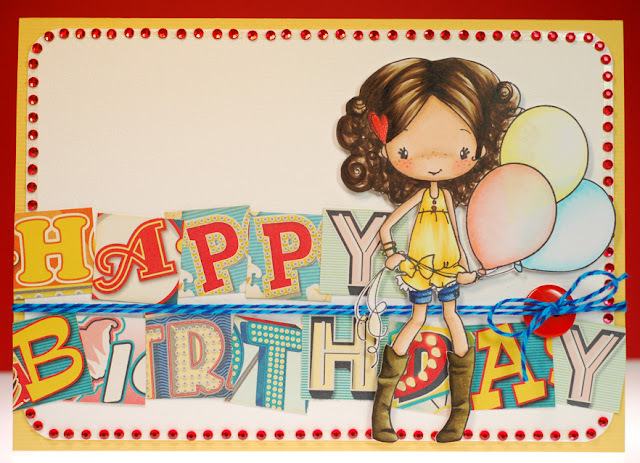 I loved the explosion of color and energy and thought that it would work well for a birthday card. In the end I only used a single sheet from the paper pad and it got all cut up just to create the over sized sentiment but I think it's enough to set the mood I was hoping for. Well, I'm still not 100% but compared to how I was feeling Saturday and Sunday I am doing much better. And lucky me, I still have today off to really get over this flu before heading back to work tomorrow. Okey dokey, take care my friends! 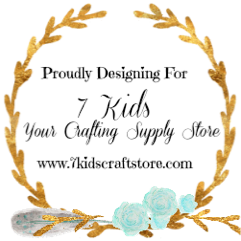 It's time to announce the winners of the Sweet November February release! Easter Pixie Bonnie goes to- Sara I.
Congratulations ladies! Please email me at: pete_danger @ hotmail.com with your mailing info and I will get your prize sent out as soon as possible. Big thanks again to everyone who came out for the February previews. 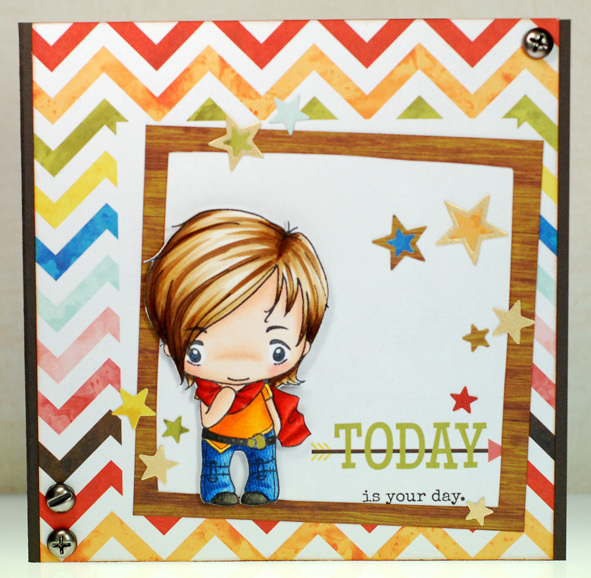 Don't forget that all of the new stamps and die cutters are now available in the ATS store. 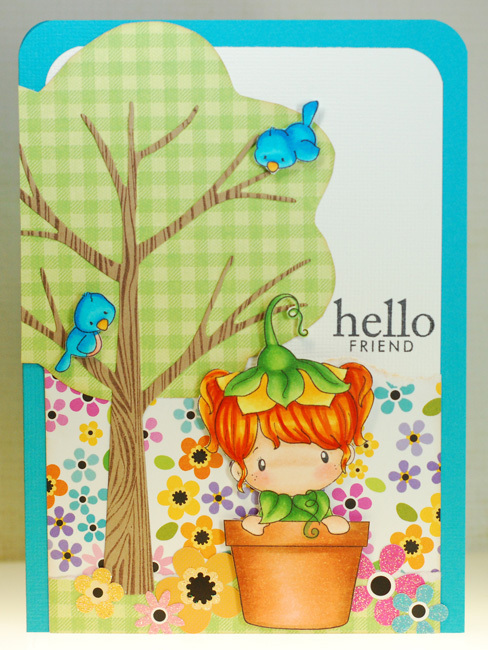 I made this card for the CC Designs preview of Potted Lucy but didn't get around to posting it here until today. I wanted to make her bright and colorful just like the flower on her head so Doodlebug was a natural choice for my papers. I colored her hair up in a more vibrant orange than I normally use for hair because I wanted it to look like it was an extension of the blossom hat. 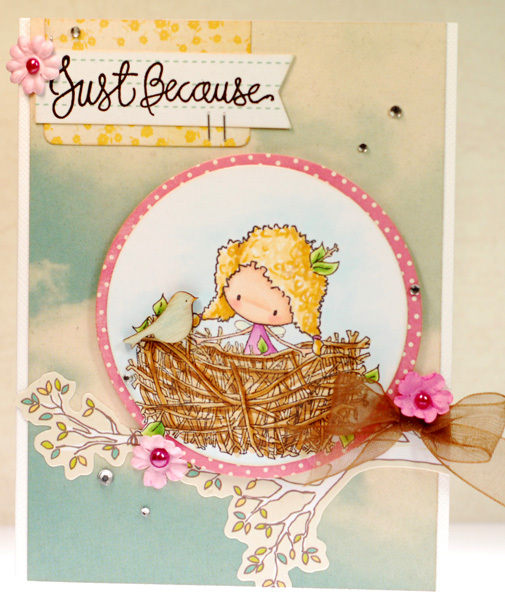 For the rest of the scene I used the Four Seasons tree die to cut out some kraft cardstock and stamped it with a wood grain background. Once I had that made Lucy needed a couple of feathered friends to keep her company. All in all I think this is a happy card. Well, I should really get myself together for the day. I'll catch ya on the flip side! 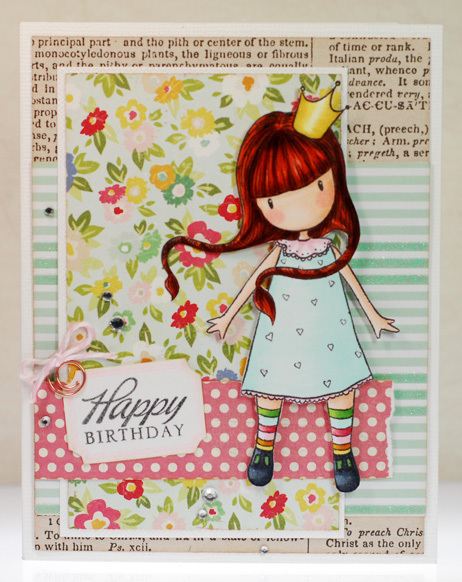 We are previewing a brand new line over at All That Scraps today! 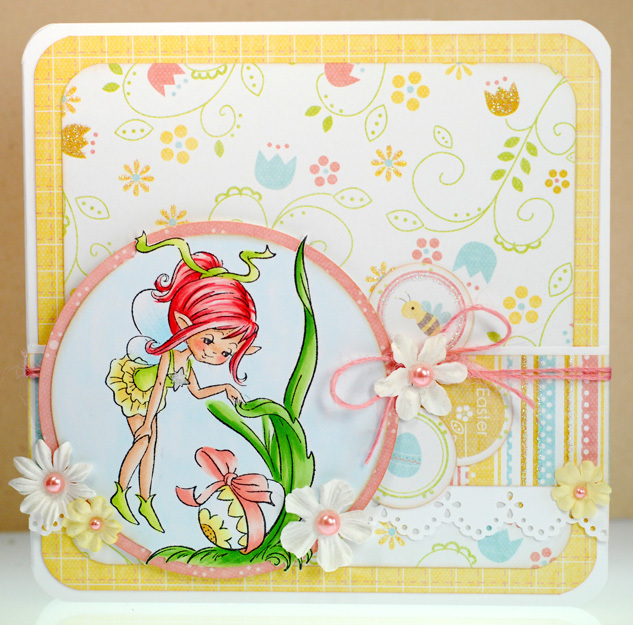 There are three new fairy images by Olga and Alexey and my card features the 'I Found It' image. It looks like this winged cutie has just found herself a fun Easter surprise. 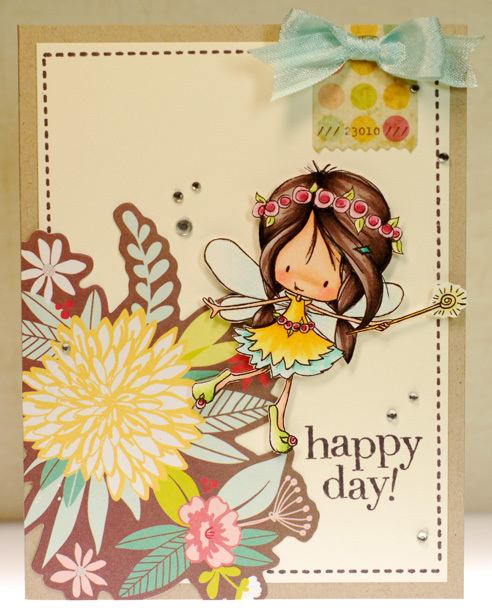 I knew right away that I wanted to deck this little fairy out in spring pastels and luckily I still had some scraps from this old Imaginisce paper line hanging around. So I matched my Copics to the papers as best I could and let the whimsical prints do the rest of the work bringing the whole card together. 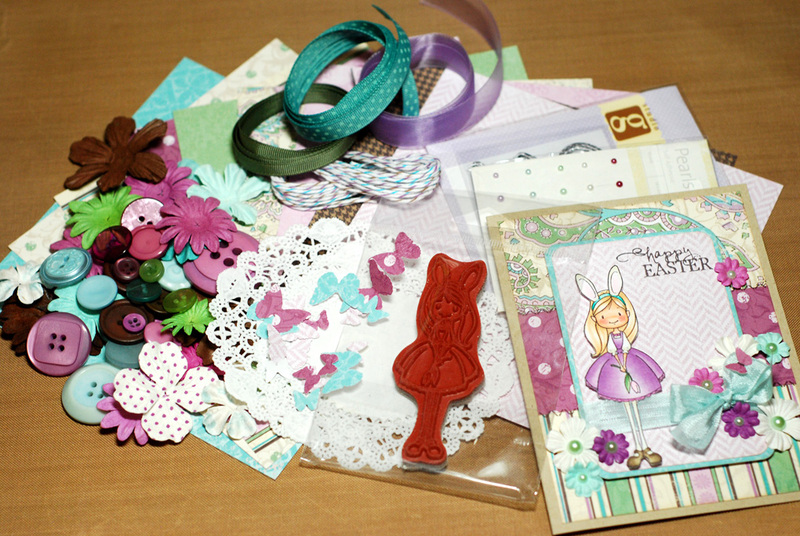 The Easter Pixie Bonnie candy kit includes; one Sweet November Easter Pixie Bonnie rubber stamp set, nine 6x6 sheets of Making Memories Boho Chic paper, Prima flowers and Kaiser Craft pearls, ribbon, twine, buttons, punched butterflies, paper doilies, four envelopes, four card blanks and my card. The candy will stay open through Friday, February 8th and I will announce the winners on Saturday, February 9th. 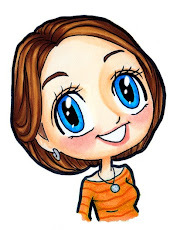 Instead of using random generator I will be printing out names and tossing them in a hat SO if you leave comments for the SN gals on their blogs, you will get an extra name in the hat for each one that you do... this will up your chances of winning the candy... fun, fun, fun! And that's a wrap on the third and final sneak peek of the Sweet November February release. 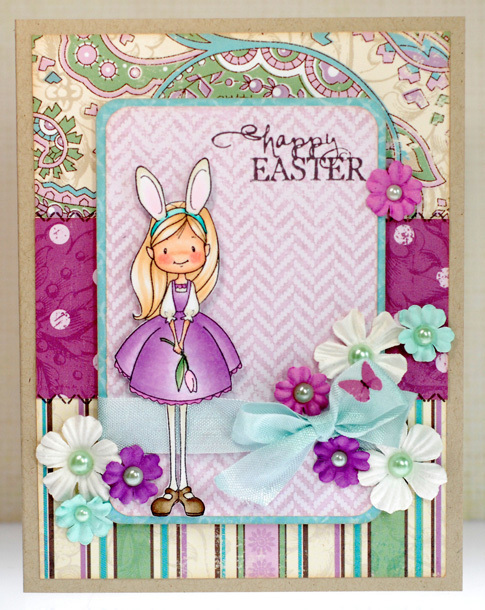 Be sure to check out the All That Scraps blog today for even more Easter Pixie peeks and another chance to win the new stamps! 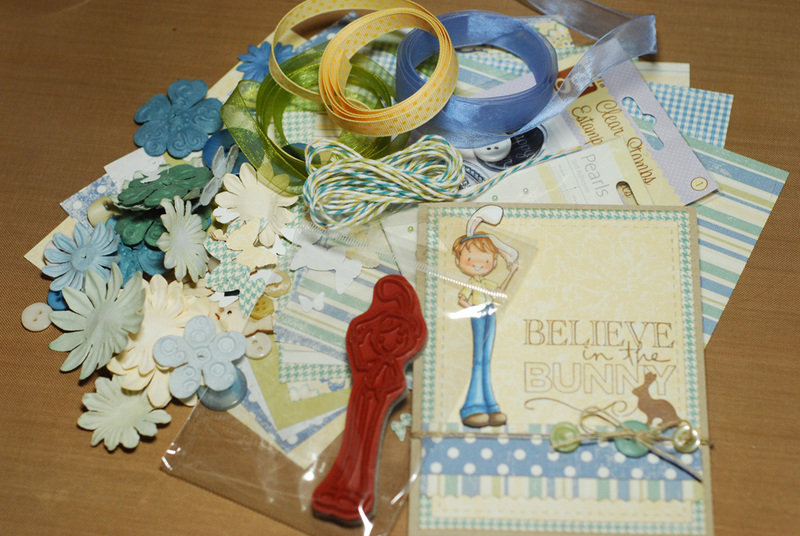 The Easter Pixie Hershel candy kit includes; one Sweet November Easter Pixie Hershel rubber stamp set, nine 6x6 sheets of Making Memories Sydney paper, Prima flowers and Kaiser Craft pearls, ribbon, twine, buttons, punched butterflies, wood veneer tweets, four envelopes, four card blanks and my card. 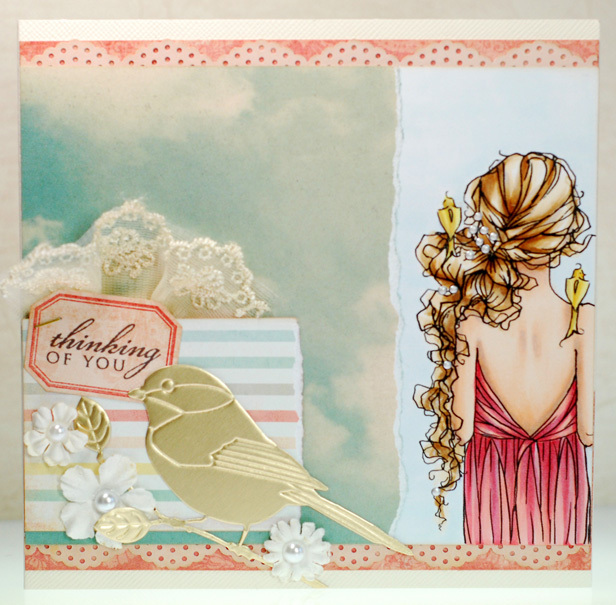 Thanks for coming back for day two of the Sweet November February release. We've got one more Easter Pixie to meet tomorrow that you won't want to miss! The Easter Pixie Esther candy kit includes; one Sweet November Easter Pixie Esther rubber stamp set, nine 6x6 sheets of Making Memories Garden Party paper, Prima flowers and Kaiser Craft pearls, ribbon, twine, buttons, die cuts, four envelopes, four card blanks and my card. Thanks so much for joining us on this first day of the Sweet November February release. 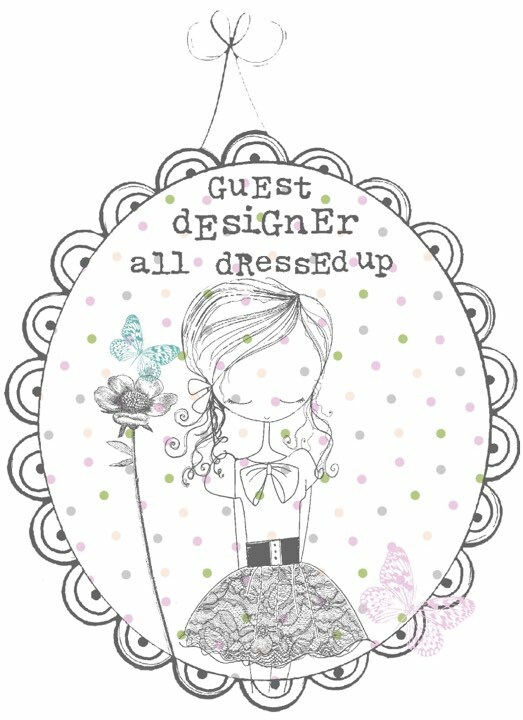 Come back tomorrow to meet another Easter Pixie who is just hopping up and down with excitement!